Tonight I ate one of the best meals of my life at Philadelphia's premier vegan restaurant, Horizons. It is so awesome to go to a place where you can eat everything on the menu, and where you don't have to quiz the server on the ingredients of every dish and how it is prepared. I emailed for a reservation and for permission to take some pics. The owner, Kate, gave me a warm welcome, and the staff was helpful and friendly. I placed my order began sipping on my drink. 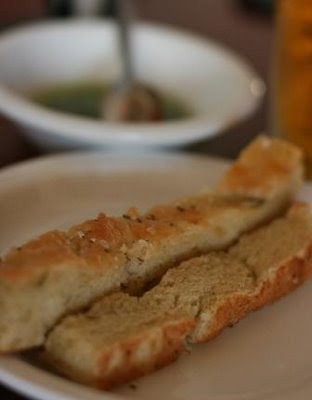 I was soon greeted with complimentary focaccia with fresh basil olive oil for dipping (pictured above). It was incredibly tender with a wonderfully buttery flavour. 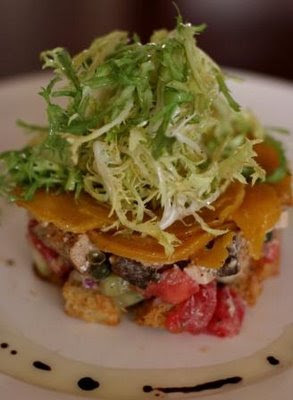 My first course was the Golden Beet Panzanella Salad. I have to say that my favourite part of the dish was the beets--they were tender and had a very mellow flavour. The smoked tofu was also very nice. My only complaint is that the tomatoes had a bad taste and texture; I think they may have been refrigerated. 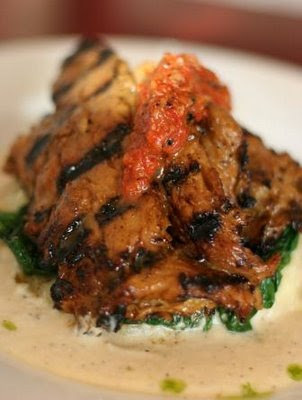 Second course: Grilled Seitan with yukon potato mash and horseradish cream. By far, this is the best seitan I have ever had. I have experimented a lot with seitan but nothing has come close to the tenderness, texture, and taste of this dish. Superb grilled flavour that was only enhanced by the horseradish cream (which is really quite mellow with a nice tang). 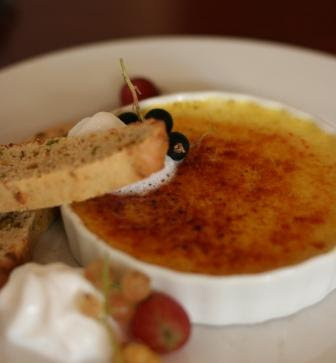 For dessert: saffron creme brule. Oh, baby.